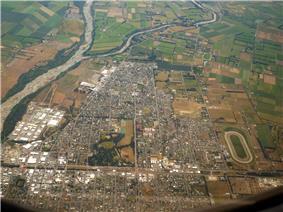 Aerial view of Ashburton, looking west. The Ashburton River or Hakatere is visible at left. Ashburton (Māori: Hakatere) is a large town in the Canterbury Region, on the east coast of the South Island of New Zealand. The town is the seat of the Ashburton District, a territorial authority encompassing the town and the surrounding rural area, which is also known as Mid Canterbury. 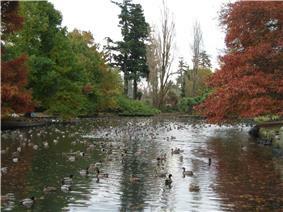 It is 85 kilometres (53 mi) south west of Christchurch and is sometimes regarded as a satellite town of Christchurch. Ashburton township has a population of 19,600, with an additional 12,400 living in the wider district. The town is the 23rd largest urban area in New Zealand and the third-largest urban area in the Canterbury Region, after Christchurch and Timaru. Ashburton was named by the surveyor Captain Joseph Thomas of the New Zealand Land Association, after Francis Baring, 3rd Baron Ashburton, who was a member of the Canterbury Association. The town is laid out around two central squares either side of the railway line and main highway, Baring Square East and Baring Square West. "Ashvegas", Ashburton's common nickname, is an ironic allusion to Las Vegas. Ashburton is on State Highway 1 86 kilometres (53 mi) south of Christchurch. The Main South Line railway line runs through the centre of town, but passenger trains ceased on 10 February 2002. The town is the centre of an agricultural and pastoral farming district, part of the Canterbury Plains. It has one large suburb, Tinwald, south of the town and the Ashburton River. Tinwald was the junction for the now-closed Mount Somers Branch railway line. The town has three other suburbs: Allenton, Hampstead and Netherby. The Ashburton District extends from the Pacific Ocean to the Southern Alps, and from the Rangitata River to the Rakaia River, including the towns of Methven, Mount Somers, and Rakaia. On the whole, Ashburton shares a similar climate to Christchurch i.e. a dry temperate climate (Cfb). However, since it lies further inland at a higher altitude to Christchurch, Ashburton experiences a greater range of temperatures. During summer Ashburton can exceed 30 °C (86 °F), whilst winter can see regular frosts and annual snowfall. Ashburton's heaviest snowfall was 60 centimetres (24 in) on 12 June 2006. Ashburton media includes the Ashburton Guardian daily newspaper, the Mid Canterbury Herald, a free weekly community newspaper owned by Fairfax Media which comes out every Wednesday, The Courier, another free weekly community newspaper owned by the Otago Daily Times, and the Mid Canterbury-focused AshburtonOnline website. Radio Port FM is based in Timaru; Newstalk ZB and Classic Hits ZEFM are re-broadcast from other out-of-town stations. There is a small recreational airport, Ashburton Aerodrome, serving the town. There are seven primary schools, an intermediate school, a secondary school and a composite school in Ashburton. All rolls are as of July 2015. Allenton School is a state contributing primary (Year 1–6) school. It has a roll of 351 students. Ashburton Borough School is a state full primary (Year 1–8) school. It has a roll of 427 students. Ashburton Christian School is a state-integrated evangelical Christian composite (Year 1–13) school. The school opened in February 2009 as a private school, and integrated into the state system in March 2011. It has a roll of 93 students. Ashburton College is a state secondary (Year 9–13) school. The school opened in 1965 following the merger of Ashburton High School and Hakatere College. It has a roll of 1193 students. Ashburton Intermediate School is a state intermediate (Year 7–8) school. The school opened in 1974. It has a roll of 346 students. Ashburton Netherby School is a state contributing primary school. The school opened in 1959. It has a roll of 130 students. Fairton School is a state contributing primary school. It has a roll of 26 students. Hampstead School is a state contributing primary school. It has a roll of 359 students. St Joseph's School is a state-integrated Catholic full primary school. It has a roll of 228 students. Tinwald School is a state contributing primary school. It has a roll of 224 students. There is a movie theatre, swimming pool and two local golf courses. There is a walking track coastwards along the northern side of the river from SH1. This was overgrown for many years, but has now been restored. The Ashburton Club and Mutual School of Arts (MSA) was founded in 1885 and continues to this day. 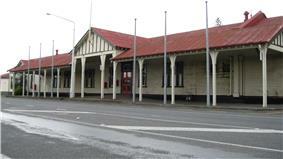 The MSA is a member of the NZ Chartered Clubs Association and is located in the central town. The club itself currently has around 4,000 members on its records. The Aerodrome is 5.5 kilometres (3.4 mi) from the town centre and NZAS is an active light (GA and Microlight) aviation hub and home of the Mid Canterbury Aero Club (GA) and Ashburton Aviation Pioneers (microlight) both of whom offer flight training. The Aerodrome is unique with no landing fees and a large aviation museum on site. The beaches adjacent to Ashburton are steep and shingly with a strong undertow, making them unsafe to swim, but suitable for surf-casting. In part to rectify the limitations imposed by the lack of recreational waterways, Lake Hood was constructed just south-east of Tinwald. It can be used for rowing, swimming, and water-skiing. The Ashburton, Rakaia, and Rangitata Rivers offer good fishing, the Rakaia in particular is renowned worldwide for its salmon fishing. Upper reaches of the Rangitata are frequently kayaked and rafted, reaching Grades 3-4. The Rakaia is known for jet-boating. The Ashburton Lakes (Lake Heron, Lake Camp, Lake Clearwater, and a number of smaller lakes) are around an hour and a half inland, and offer water sport and fishing opportunities. On the road to these lakes are Mount Somers and the Mount Somers walkway. 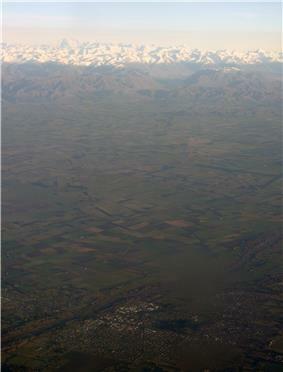 Mount Hutt is a South Island ski field an hour inland, just past Methven. Prominent residents have included the former Prime Minister of New Zealand, Jenny Shipley, international operatic tenor Simon O'Neill, Olympic silver medal cyclist Hayden Roulston and New Zealand television and radio personalities Simon Barnett and Robyn Malcolm. Hugo Friedlander was the second Mayor of Ashburton (1879–1881, 1890–1892 and 1898–1901), but left for Auckland in 1918 due to anti-German feelings caused by WWI. ^ "Mayor Bede O'Malley". Ashburton District Council. Retrieved 30 October 2009. ^ Peters, Pam; Collins, Peter; Smith, Adam (2009). Comparative Studies in Australian and New Zealand English: Grammar and Beyond. John Benjamins. p. 57. ^ "Niwa Science climate data". ^ "Ashburton Crowned ‘Cooperative Capital of NZ’". ^ "Directory of Schools - as at 17 August 2015". New Zealand Ministry of Education. Retrieved 2015-08-20. ^ McCausland, Ray. "Hugo Friedlander". Reed, A. W. (2002). The Reed Dictionary of New Zealand Place Names. Auckland: Reed Books.